Please, if your post is a joke in German language, be so kind to translate it to me. Sure, oh Regina Malissima Mea! "Was ist das Gegenteil von Frühlingserwachen?" - "Abends rechts einschlafen!" This one plays with the similarity in the sound of "Frühlingserwachen" ("awakening of spring") and "Früh links erwachen" ("awaking on the left in the morning"). Aaaahhh... so long time with no spam in this section... Well, it's not spam, but let's bring it to life again! At least, a little. As I already said in the shoutbox, I've just signed in to an intensive German course. I feel that I barely improve during the regular course (few time to study at home, perhaps the teacher, hard for me to dig for motivation on weekends...). So, I looked if any intensive course is available at afternoons during July, when I work only until 15h. Not in my academy, but there's an Official Language School in Barcelona where there is. And there I go! It will be one month, from Monday to Friday, von 16 bis 20 Uhr. Vier Stunde per Tage! Not bad! (specially when I work from 8 to 15h...). I'll be arriving home very late, so I already know I'll have no life during this month in the workdays. But I really think this can be the way to really improve in German, at least, enough as to feel I'm learning something and enjoy it a little more. Thursday 19th I have to make a test to know in which level they put me in. I'm supposed to be able to get the A2, but I wouldn't mind repeating the A2 this month and learning it better... It's not up to me, I'll know the 30th, the first class day. So... if anytime soon I start speaking (bad, terrible) German, it's because of the course. I WISH TO BE ABLE TO KILL DEUTSCH MORE! THE MORE I KNOW, THE MORE I CAN KILL IT!!!! 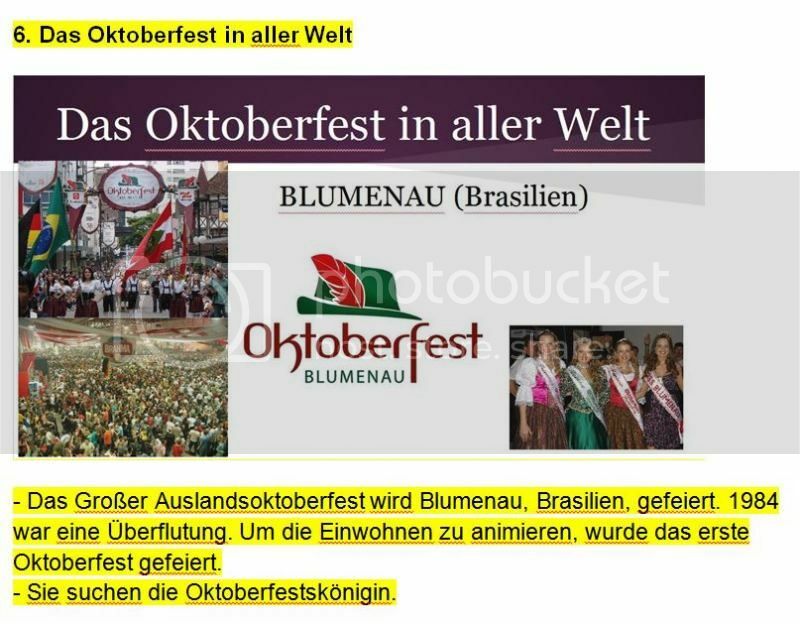 Das wird schwer, oh allerböseste Königin. Aber ich hoffe, es bringt Dir viel! 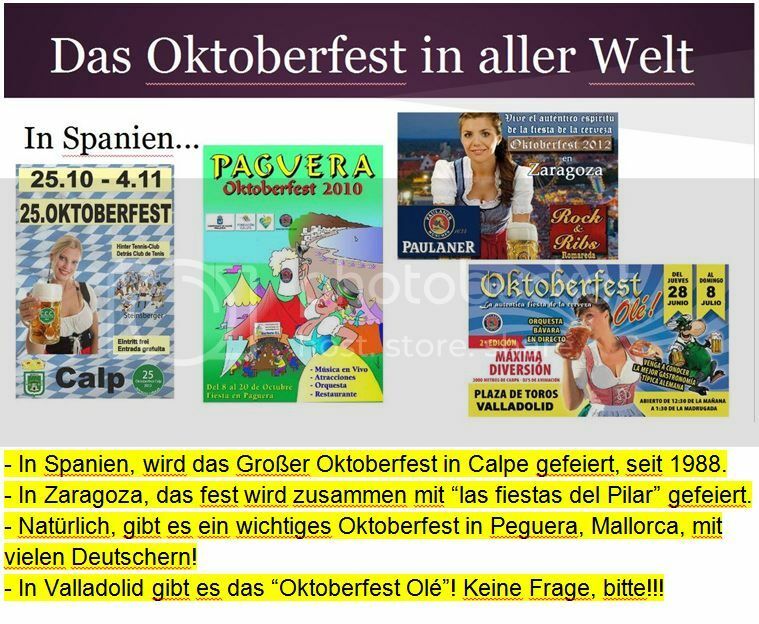 Viel Spaß, viel Erfolg und ! 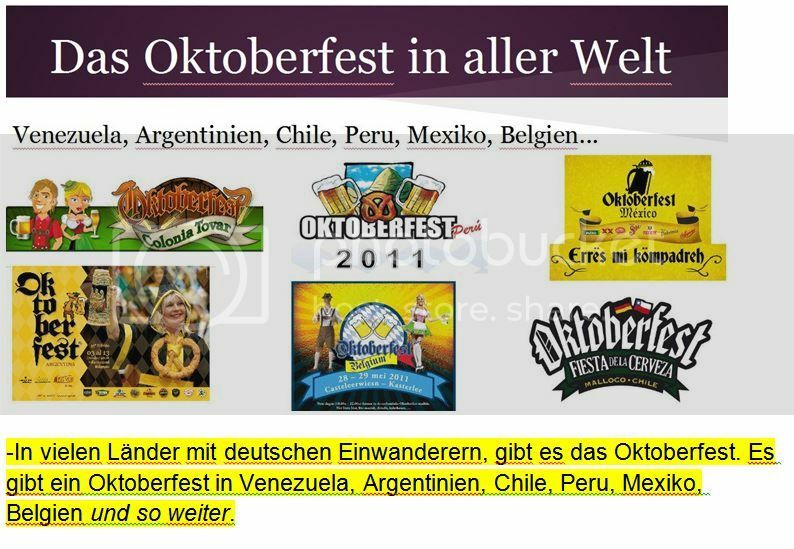 I need a little help... How would you say, auf Deutsch: "The Oktoberfest through the world"? 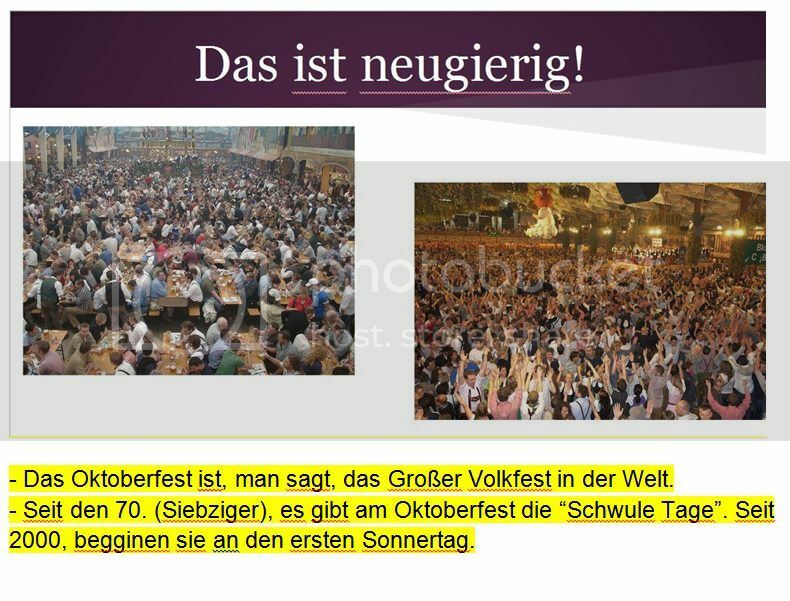 "Das Oktoberfest durch die Welt", literally. What exactly is the sentence supposed to mean? It's the title of one of the parts of the presentation I have to make. 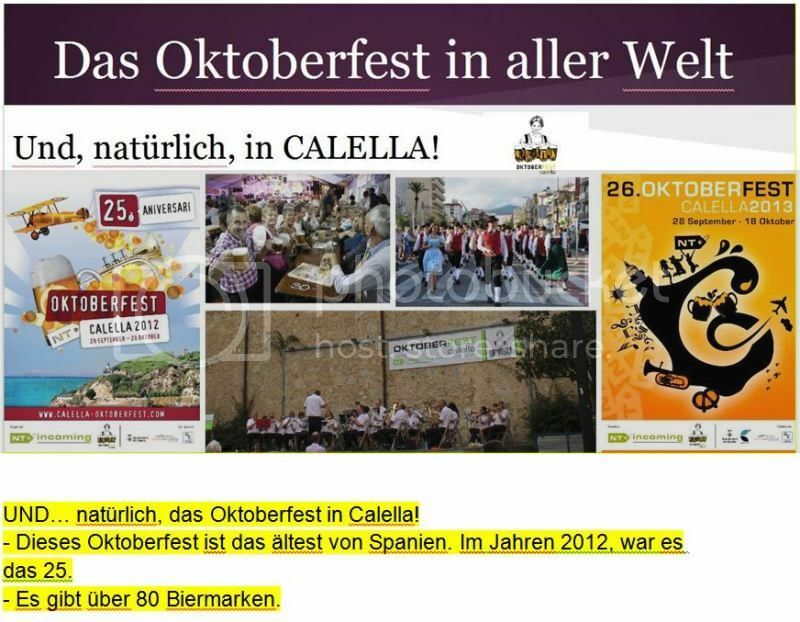 I'll explain about other Oktoberfest out from Germany (for instance, Calella! ). Gern geschehen - und viel Erfolg! Ok, morgen schreibe ich alles... aber... and sorry, but Deutsch later! 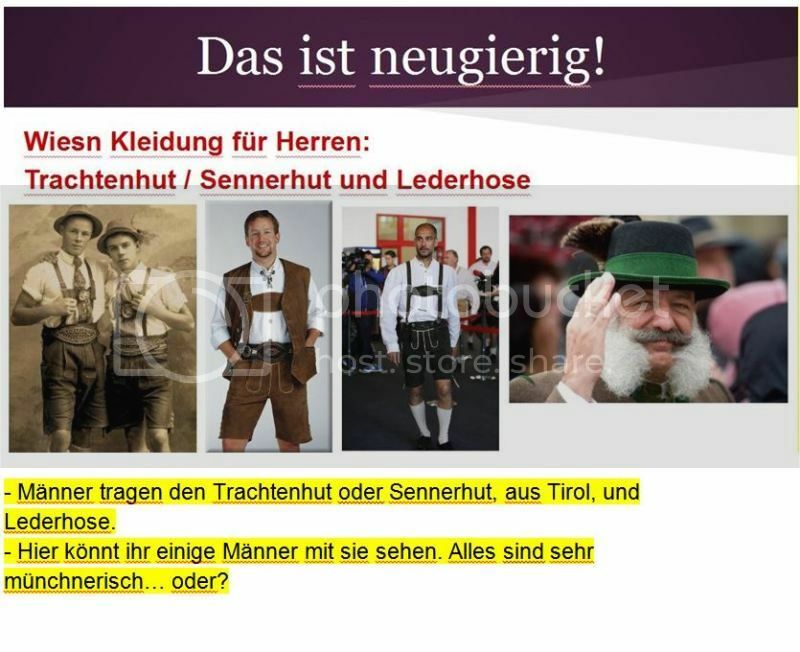 Ich bin müdeeeeee! Today I've made the last class... We got our marks, and my group (and another one) have made the presentation. My marks: 9 out of 10. (1 point for making all the Hausaufgaben and all work required). The presentation? Sehr gut!! Better than I would have thought (not perfect, of course...!!!). 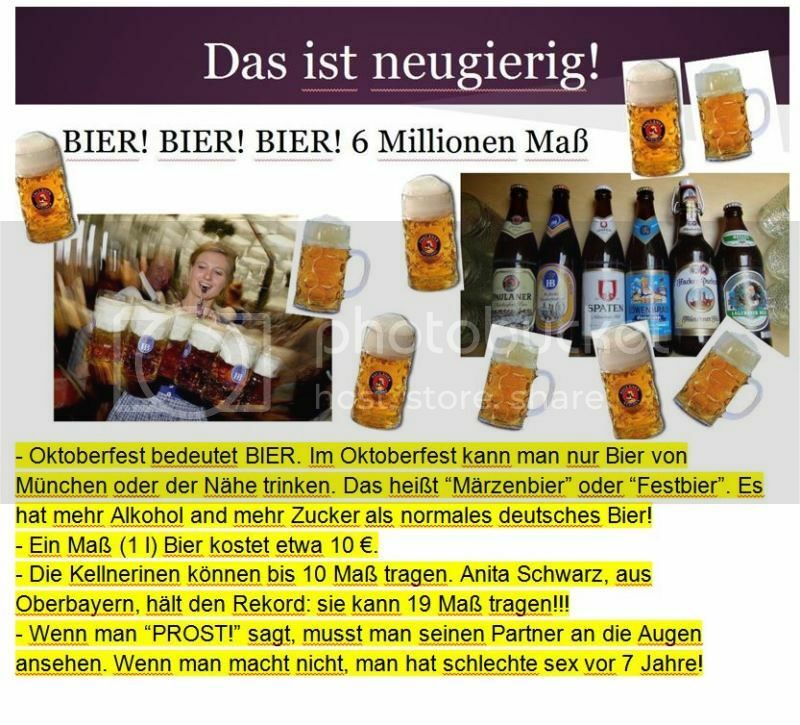 And sehr lustig! Tomorrow I'll explain... People laughed and... disguised a little... bwahahaha! As I told you, yesterday was the last day of my Sommerkurs (80 hours in 4 weeks... not bad!). It has been a very rewarding experience, and I think I'll do it again next July. Yesterday, my group had to make the presentation (each group is formed by 3 people). 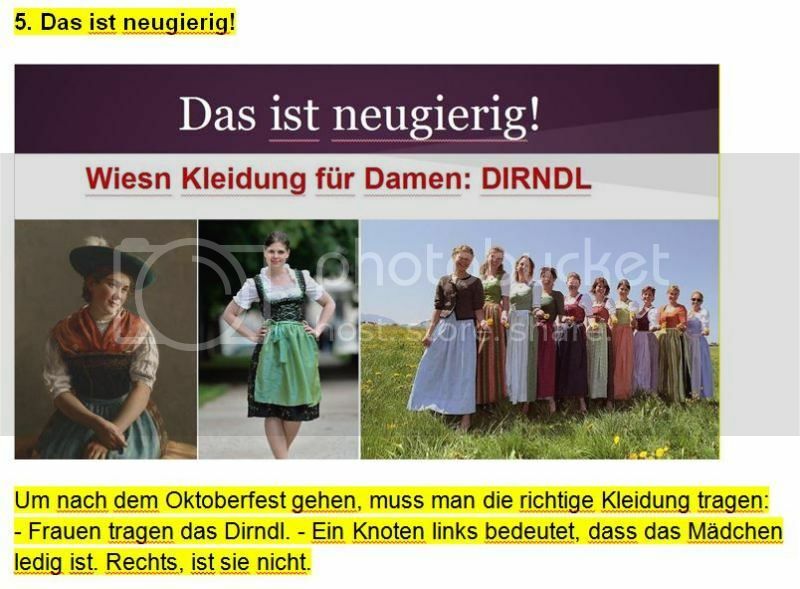 As it was the last day, and we chosed a festive topic (Das Oktoberfest), we decided to make it a little more... festive! The other groups made a normal Referat: they used the powerpoint, each of the members explained something with the aid of the images, and nothing else. We... changed the rules a bit. I think it was fun, so I'll explain a little more! (BTW... I changed the title of the first 4 slides: instead of "Wie neuerig! ", which I was not sure if it was right, I wrote "Kuriositäten"). We had some fun there! And, to end (by now...): my English is in danger! One day, just after the 4hours-class, I was waiting in the platform for my train, and a tourist asked me, in English for the train she had to take. I explained her in English, of course... but instead of "yes", I kept saying "ja". Instead of "no", "nein". And, instead of "but", "aber". I was crazy!! All the words more usual come to my tongue in German instead of English! And the tourist... she might have thougt "Oh my, I've asked the wrong person. She obviously speaks more German than English!". Maaaarkuuuus... We must meet again! Next time we meet, I'll be able to kill German a lot more than previous meetings!!! PS. I explained it all in English because it's too long and too complex for my poor little German. From now on, I'll try to write here shorter posts, but auf Deutsch!